I actually didn’t plan on “announcing” the winners, but I did want to give some credit to some great contributions and my appreciation for those that attempted given such short notice. Winner #1: Matthias and Presidential newspaper timeline. Seriously you have to check this out. 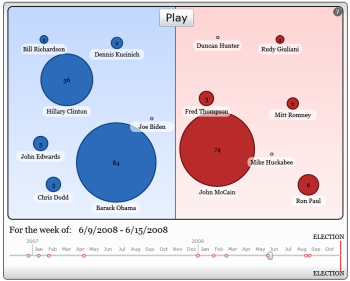 Inspired by the Descry demographics, Matthias used the NYTimes API to gather data about US Presidential candidates and put them on a timeline…each candidate’s representation changing on a timeline which covers 2006-2008. I really liked this, it was creative. Great job Matthias! Congratulations guys! I hope to see you at MIX09 and hope you have a great time and continue to be inspired about what you see in Silverlight! John created some data visualizations of airport wait times. Thanks to you all for participating. It was fun to see some different ideas from folks on such a short timeframe. Congrats to Matthias and Jason as well and we’ll see you at MIX09 in Vegas! If you are in the contest mood, you can also write a game using Silverlight and have a chance at winning $5,000! (sorry, US-only contest – don’t shoot the messenger).